Edward had made the decision to move back to his hometown, Philadelphia. He was one week away from taking the train across the country train from Los Angeles. With nothing to lose he decided to send "NOFUXGIVEN1005" a message on a popular online dating site. The day after Easter, Mikki's mother passes away unexpectedly. They spoke like old friends from the start. They laughed and confessed things to each other. Their chemistry was electric even if just by phone. They feel asleep on the phone like teenagers. When she woke up, she texted him immediately to make sure I didn't say anything foolish in her sleepiness. He informed her that she had made quite the impression. He said she had been very attentive and present throughout the conversation. She was relieved. So she pressed again. She wanted to see him. After all, Philly was not Zimbabwe! She wanted him to experience her in the flesh before leaving. Finally, he invited her to breakfast. Mikki was a bit self-conscious because she had just chopped off her hair and hadn't even dated a man in all of 2016! She picked him up and they went to a diner nearby his apartment. They split a pancake breakfast. They finished each other's sentences more than once. He asked her if I knew why people cheers before drinking. She must have given him the answer he was looking for because he was so impressed that she knew the reason. That was the first time she heard him say "I'm going to marry you!" She thought he was joking. By the end of the breakfast they had gone even deeper. She opened up about how her mom's death changed her perspective on time. He asked her a few questions about marriage and family. Again her answers must have satisfied him because he proposed right after! But she said no because she said she wanted a better proposal. The breakfast ended. When they got outside, Edward got down on one knee in the parking lot of the restaurant. He somehow made a ring out of sugar packets and asked her to marry him, again! Before she could answer two ladies heading into the restaurant started screaming "congratulations!" She said yes. But he was still scheduled to leave at 6pm that night. They went to his apartment and tried to formulate a plan to keep him in LA but they came up short. He decided to follow through with the plan to go to Philly. ​ She drove him to the train station. 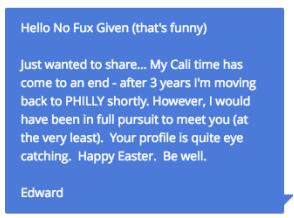 Edward was in Philly one day before they decided on the plan for him to go back to LA to start building a life with Mikki. For 16 days they got to know each other over the phone. On April 19, 2016, Edward arrived back in LA . They headed to an Air B and B for a few days because Mikki was sharing a house with one of her best friends. They spent the rest of the week searching for apartments until her friend announced she would move out of the house. Although the gesture was favorable to the couple, the result was the end of that friendship. They decided that they would tie the knot fairly quickly on October 15, 2016, mainly because the Christian couple wanted to remain celibate throughout the engagement period. From the moment they became engaged, they were in full wedding planning mode. Mikki was hoping to fulfill all of her childhood fantasies of having a big white wedding where all eyes would be on her. She submerged herself in every detail of the day. 15 secret Pinterest pages later she was completely overwhelmed. Edward sensed her frustration and suggested they ditch the pomp and circumstance in favor of a stress free but meaningful civil ceremony. She was PISSED that he would even suggest she give up her dream to get married in a courthouse! The anger lasted for about 15 mins before she realized he was right. She had to sit with the idea and let it really soak in. The more she thought about the more she started to love the idea. If it was really about the marriage and not about having a wedding then there should be no problem! They naturally assumed that they would keep their original date but they were wrong. They begin an 11 week pre-marital counseling course at a church in Inglewood. ​They go to the jewelry store to "look"at wedding bands. By the time they walked out of the store, wedding bands in hand, they made up their minds to elope the next day. Mikki purchased a dress off the rack for $150, shoes for $20 and booked a chapel all inside of an hour. Edward found what he needed at Nordstrom nearby. With her makeup appointment booked and bouquet set for an early morning delivery, they were ready to get married the next day. 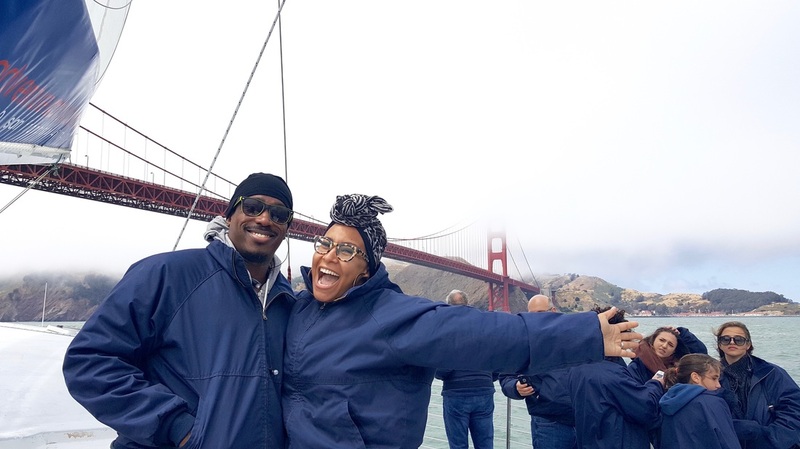 It took just three hours to plan their elopement and subsequent honeymoon in San Francisco (Mikki's birthplace and her mother's favorite city).